What we don't talk about when we talk about aging is the cost of health care. The annual health-related cost to various levels of government for a 45-year-old might average about $2,675, according to data obtained by the actuarial firm Eckler Ltd. from the non-profit Canadian Institute for Health Information. Make that $6,235 for a 65-year-old and $30,100 for a 90-year-old. Spending by individuals rises, too. The institute says costs paid out of pocket for a range of medical care that includes prescription drugs (the portion not covered by provincial drug plans), para-medical services, dental and glasses, currently average around $2,700 for people between the ages of 55 and 80 and more than $5,600 a year for those who are older. The inflation rate for a full range of goods and services is running at about 1.3 per cent these days. For health-care costs, think about 5 per cent. The financial industry has made a decent start at preparing the country for longer lives. Financial planners typically use 90 as a default lifespan, or longer. They're also getting better at basing plans on how people will actually spend in retirement as opposed to overly general rules about the percentage of your working income that you should strive for after you leave the work force. 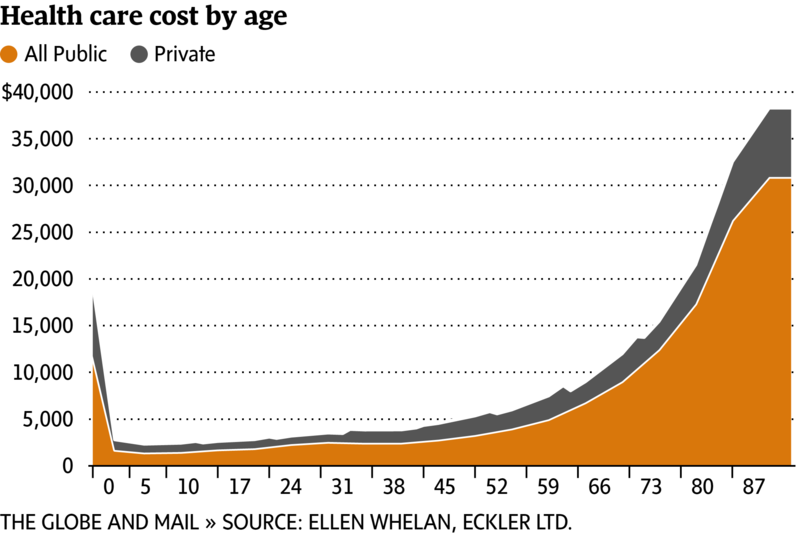 But we're still not talking enough about an obvious implication of longer lives – the cost of health care. Current and soon-to-be retirees need to digest these costs, and so do the millennials and Gen Xers who will retire in the future. By 2063, one in four Canadians will be 65 and older. Combine this aging trend with the higher costs of health care for seniors and you start to wonder whether the provinces will introduce deductibles or co-pay arrangements for medical services now fully covered by our tax dollars. "I think governments are absolutely going to have to do something," said Ellen Whelan, a principal at Eckler. For now, let's use $2,700 as the reference amount that seniors need on average each year to pay for health and medical costs not covered by government. Your costs might be less than that if you have employer-paid health benefits in retirement. But as noted in a recent column, this coverage is fading in much the same way as defined-benefit pension plans. Two things to know about that $2,700 figure – it will rise annually at a faster rate than the overall inflation rate, and it will come under further upward pressure as you age because you'll need more care. So figure on paying less than $2,700 when you first retire and more as you age. Ms. Whelan thinks 5 per cent is a sensible inflation rate to apply to health-related spending on an average annual basis. By her analysis, someone who is 60 today will need about $115,000 to cover out-of-pocket health-care costs over the rest of their life. Ms. Whelan estimates a 40-year-old might need an amount closer to $140,000 for health-care costs from the age of 60 and on. This is based on that same current $2,700 figure increased by the same 5-per-cent inflation rate starting now and continuing past the age of retirement. The impact of having the government shift even a modest level of medical costs on to individuals would be big. Ms. Whelan figures that a shift of 10 per cent of costs would raise the out-of-pocket bill for future health care to almost $200,000 for someone who is 40 right now. This would argue for 40-year-olds to start saving $5,500 a year so they can have $200,000 for health costs by the age of 60 (assumes net returns of 5 per cent annually). A fun part of retirement planning is figuring out all the living costs you won't have to pay when you leave the work force. For one thing, you won't have to save for retirement any more. But at the same time, you have to budget for increased spending on health care. That $2,700 number is a good start. If you don't spend this much in a year, park the difference in a kind of health-spending account that you can draw on in the future. Put yourself in a position to say of health-care costs in retirement: "I saved for that, so I'm okay." Below: See how the cost of both government-paid and out-of-pocket health care rises dramatically as we age.